This year, the tech industry and developers have started to question their role in society. Is the job essentially amoral or do we have any ethical responsibilities for the products we design, write, test, and run? In its 2018 survey, Stack Overflow asked developers this question for the first time and the answer was clear. In an ideal world, devs would like to be ethical in their work but they ultimately don’t consider it to be part of their responsibilities. This eMag sets out to understand why they might feel that way and whose job it is to take reasonable steps to ensure that tech products don’t harm users or anyone else. The conclusion is that engineers within the tech industry have a lot more power than they realise. That power comes in the form of their highly valued skilled labour and their knowledge of how software and algorithms work. Both are lacking in the general population — and on company boards. With great power comes the proverbial great responsibility. In this world of new technologies like artificial intelligence and machine learning, we are all going to make a lot of mistakes. The sooner we catch them, the less harm we will do. The vast majority of businesses are not evil. They don’t want to hurt their users — it’s ultimately bad for business. However, they will make many unintentional errors while they are learning. Sure, something that seems wrong might be part of a villainous plan but don’t assume so when you see it. Most likely, it’s just a mistake. Say something. If you don’t speak up, people will get hurt. We are the last bastion of defence against unethical —more likely inadvertently harmful — code going live. As Dobson points out, often all we need to do is say something to make a significant change and be the moral people we want to be. Data Citizens: Why We All Care about Data Ethics - Data citizens are impacted by the models, methods, and algorithms created by data scientists, but they have limited agency to affect the tools which are acting on them. Developers. Our Last, Best Hope for Ethics? - In March, Stack Overflow published their Developers’ Survey for 2018 and for the first time they asked questions about ethics. The good news is that to “Do Developers Have an Obligation to Consider the Ethical Implications of Their Code?” nearly 80% responded “yes”. However, only 20% felt ultimately responsible for their unethical code, and 40% would write unethical code if asked. 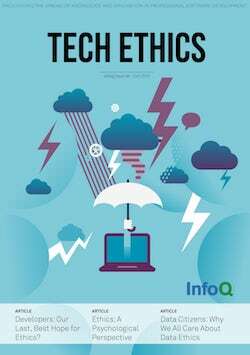 Ethics, a Psychological Perspective - With emerging technologies like machine learning, developers can now achieve much more than ever before. But this new power has a downside. Only recently, Facebook’s chief executive apologised in front of the European Parliament for not taking enough responsibility for fake news, foreign interference in elections and developers misusing people’s information. The Ethics of Security - Like security, tech ethics is about trying to prevent our systems from hurting users or anyone else.